‘Beyond Change’, a wide-ranging conference in Basel, Switzerland, gave voice to subjects often ignored within design discourse. By Katie Evans and Gabriela Matuszyk. 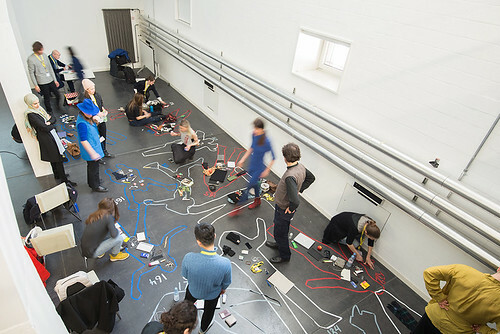 It was also the first day of the design research summit organised by the Swiss Design Network, who have been organising such symposiums since 2004. This second winter summit, under the name of ‘Beyond Change’, was launched by an all-women team. When organiser Claudia Mareis was asked about the significance of this launch date, she said it was ‘a happy coincidence’. 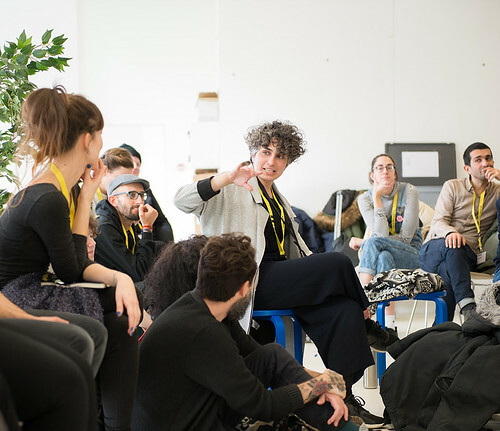 Academic Danah Abdulla at the ‘Decolonising Design Group’ platform session at ‘Beyond Change’, 2018. Top: Event posters used as a canvas to raise attendees questions in Breaking Ground workshop. All photos by Samuel Hanselmann, IXDM, 2018. Led by Mareis and coordinated by Brazilian graphic designer Nina Paim, ‘Beyond Change’ brought together almost 400 designers, researchers, academics and postgraduate students who, over a three-day symposium, explored urgent questions on ‘the Role of Design in Times of Global Transformations’. The tightly packed schedule included seven keynotes, 23 sessions, 51 presentations, 25 moderated discussions, five workshops, three platforms, one film, one ‘audio-walk’ … and zero time to waste. The event programme explained that ‘Beyond Change’ began as a response to the current climate of ‘ongoing catastrophe’ and ‘the normalisation of crisis’. A call for papers launched in May 2017 brought up the issue of the ‘God complex’ – the belief that designers are able to design their way out of anything. Animated gif by Sunjung Park, 2018. Animated gif by Haejeung Paik, 2018. Paim and her frequent collaborator, designer and writer Corinne Gisel, worked with students at the FHNW Academy to create visuals that: ‘put design at the centre to show how design is part of the problem.’ In becoming ‘prosecutors of design’, the students made animated GIFs (above and below) that addressed issues such as consumerism, body modification and the environment. Paired with provocative questions, i.e. ‘What new design will be needed to solve the problems your design created?’, these flashing images set an urgent tone. In using the typeface Papanekst (Dinamo Typefaces), redrawn from the cover of the Bantam edition of Victor Papanek’s book Design For the Real World (1973), it is possible that the organisers wanted to show that these questions and issues are neither new, nor easy to fix. Animated gif by Arianna Smaron, 2018. Animated gif by Naz Naddaf, 2018. The event kicked off with a series of group workshops. These included: mapping the environment; experimenting with vision; and questioning social structure through sport. At the heart of these workshops was the ‘Building Platforms’ project, where three groups – ‘Decolonising Design Group’, ‘Depatriarchise Design’ and ‘Precarity Pilot’ – came together to encourage discussions about gender, race, working conditions and more, which continued throughout the conference. These activities fostered an atmosphere filled with curiosity and active participation, placing everyone on an equal level, figuratively and literally. This switch from the traditional expert-attendee dynamic set the tone for the whole event. ‘We’re not saviours’ says Paim, ‘design is not the solution to all problems’. Shifting the position of the designer from ‘problem-solver’ to ‘problem-owner’ was a key theme of the summit. An example of this was discussed by the duo of authors and researchers Beatriz Colomina and Mark Wigley, who during their keynote (entitled ‘Are We Human?’) focused on the role of design throughout the ages: ‘We are the only species that systematically designs its own extinction’. They challenged the current misconception of design as ‘progressive’, instead acknowledging its limitations as a ‘retroactive act’, rooted in past experiences and judgements. Workshop 1, ‘Luggage Fitness: Decluttering Your Body Environment’. In the panel discussion ‘Institutions and their policies of change’, researcher Sria Chatterjee described how the connection of local and global issues affected design in mid-century India. She spoke of the conflict between different design schools that took place post-independence: the rural traditional crafts versus an urban attempt at western Modernist industrialisation involving Charles and Ray Eames and others. Reluctance on the part of urbanists and outside experts to engage with local heritage, culture and environment meant the project was considered a failure – an example of top-down western colonialism. This collective activity was also explored in the way an individual acts, designs and communicates. 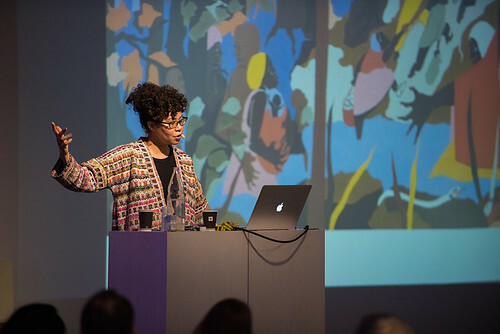 Ramia Mazé, a professor of New Frontiers in Design, stressed the importance of designers’ understanding of: ‘what world, what relations, what politics they create through the things that they do and the things that they make.’ Mazé’s own example of this, as a feminist and scholar, is through her research in participatory design systems – she ensures her citations are at least 50 per cent female, a task that requires dedication when hunting through predominantly male-dominated libraries. Keynote speaker Mia Charlene White giving her talk, ‘Love: A Blues Epistemology from the Undercommons’. Fellow keynote speaker Mia Charlene White, assistant professor of Environmental Studies at The New School in New York, shared her own origins and experiences in relation to white supremacy, black culture and slavery. Her talk was a captivating extension of her Autoethnographic research, an example of how to understand one’s position within larger contexts and in relation to others. The conference’s closing events were a keynote from design theorist and sociologist, Benjamin Bratton, followed by a screening of Fabrizio Terranova’s film Donna Haraway: A Story of Earthly Survival (2016). Both the talk and the candid portrait of Haraway – a distinguished feminist and ecologist – provoked many thoughts about our relationships with the environment, nature and technology. ‘Beyond Change’ was a call to action and an opportunity to question ‘the role of design in times of global transformations’. Challenging the idea of design as a tool that will save the world, the conference marked a moment in time, perhaps a change in the Zeitgeist. The event demonstrated that design is never just an isolated task but a social one – we need peers in order to question our prejudices and assumptions. In underlining the complexities of the issues designers deal with on daily basis – issues that are often overlooked in the rush of fast turnaround – ‘Beyond Change’ was a reminder that seemingly small tasks can carry consequences, and that designers are only human. Donna Haraway: A Story of Earthly Survival (2016) by Fabrizio Terranova.